This thing is packed full of protein and is delicious. It gets bonus points for taking about 5 minutes to make! 1. You can use a mug, but I use a glass Pyrex bowl to make this in (be sure to grease it), it shapes it much nicer. 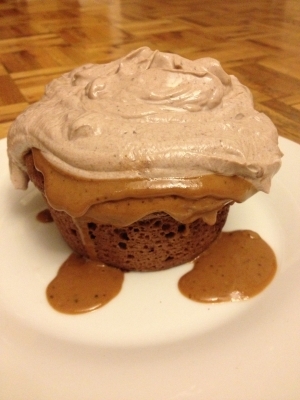 Combine all ingredients except for 1 tsp of vanilla extract, 1 packet of stevia, PB2, cocoa and Greek yogurt. Make sure the mixture is mixed very well, now pop it in the microwave for 1.5 to 2 minutes. 2. Take it out of the microwave and plop it on a plate, now pop it in the freezer for a couple minutes. 3. Mix your PB2 with water (following the directions) to make peanut butter, now spread that on top of your cake. 5. I popped mine back in the freezer for 2 or 3 minutes (I was hungry) and then devoured!